Haringey offers suburban living with thriving cultural communities providing plenty of diversity. Rentify can help you make the most of your letting with our handy borough guide. At Rentify we have property specialists dedicated to Haringey, armed with local expertise and unmatched valuation knowledge to find you the right tenants. Haringey is a borough of striking contrasts. Western districts such as Muswell Hill and Highgate offer leafy, suburban living with plenty of boutiques and gastropubs attracting a wealthier crowed. To the east, poorer districts like Tottenham and Wood Green have a more built-up, urban landscape. Sitting above the districts is regal Alexandra Palace providing locals with a variety of concerts and other events, as well as spectacular views across London. Another of the area’s main attractions is Highgate Cemetery, which offers popular tours around its Victorian grounds. Haringey is well served by Piccadilly, Victoria and Northern lines in addition to various London Overground and mainline rail connections. For such a diverse borough, it’s no surprise that there’s a mix of property types to be had. Flats are the main type of housing available, particularly in Wood Green and Tottenham, whereas Victorian terraces and period properties can be found in more affluent parts of the borough. Haringey's many districts each have their own character, catering to a variety of residents. Here's our top picks for new landlords in the area. 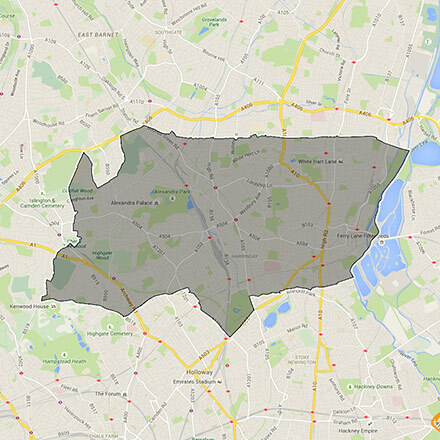 This borough covers the N10, N11, N15, N17, N2, N22, N4, N and N8 postcodes. Rentify uses proprietary methodology for data collection and processing. Borough data is collected from Rentify's property database and external public sources.